In Journey Beyond Hardship, author Greg Pacini offers a down-to-earth and compelling manual for making your way through difficult times. You may be fighting with all your might to leave an abusive relationship or to recover from an addiction. Your body may be altered by illness or injury, and the adjustment may seem more than you can bear. Miscarriage may have you mourning more than you imagined possible. You may be picking up the pieces of your life after a natural disaster. You may be heartbroken. You may be a target of prejudice. You may be in terror at the news of a diagnosis. You may be struggling after months without work. Your life may feel empty for some clear reason or no reason at all. Whatever the source, if something continues to be hard for you, then it is hardship. Difficult thoughts and feelings come with difficult times. 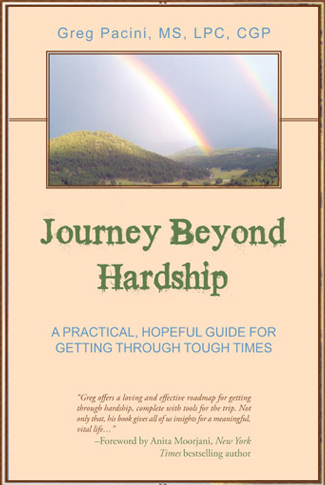 As a guide for these tough times, Journey Beyond Hardship not only provides a road map for the trip—it offers concrete tools for making your way. One technique called Reading the Edges allows you to experience emotions without being overwhelmed by them. Hope can be hard to come by during times of trauma and tragedy. Journey Beyond Hardship introduces a science-based means for generating hope. Hardship is part of the human condition. So is the human spirit to overcome.